Because I still have enough self-respect as a researcher (even when completely outside my field) to draw on sources other than the interwebs, I hopped down to the library and checked out an actual book. With pages. It is Laurence Dreyfus’s Bach and the Patterns of Invention* and the first chapter is helpfully titled “What is an Invention?” Good question, LD. Turns out, not only was I slightly ignorant for not knowing the defining qualities of a musical invention (good news, there are none), I was really ignorant for not recognizing it as a term from classical rhetoric. (Duh…)** Cicero’s handbook for orators is even called De Inventione, and in the simplest sense, this term means ideas or subjects or stuff about which one speaks. In Bach’s sense, Dreyfus claims that this is the “musical subject whose discovery precedes full-scale composition” (2). And here, apparently, is where it becomes important to really think about the influence of classical rhetoric on music at this time. Because the only way that you came upon inventions or subjects for oration, would be by studying rhetoric that already existed, so in this way, the term denotes both ‘invention’ in our sense of the word (the novelty of the individual idea/creation) and ‘discovery’ (the finding of things that already existed). I don’t want to spend too much time here, even though there is a lot more to be said about rhetoric and musical composition. What I’m really interested in, however, is the role that Dreyfus wants to give the concept of inventio in understanding Bach as a composer, because he sees a vital joining of two realms that music theorists tend to separate, which are the technical aspects of composition and the inspiration of the idea itself. “This important notion of development or realization, moreover, implies that a successful invention must be more than a static, well-crafted object, but instead like a mechanism that triggers further elaborative thought from which a whole piece of music is shaped” (2). “The problem here is a pervasive one within the study of the arts, no less within historical musicology and musical analysis: the fact that contemporary scholarship, for all its accomplishments and methodological sophistication, so often becomes reticent when it comes to capturing some semblance of a profound musical experience” (4). Let’s put this simply – theorists have a problem dealing with the slightly mystical, slightly wishy washy experience of artistic inspiration. It also becomes a problem for them to talk about Bach’s “greatness” (4) without resorting to the intuition that comes with listening/playing his works, but also without resorting solely to their technically interesting aspects. This is where ars and techne come together for Dreyfus, in the full elaboration of the concept of inventio. Using concepts from rhetoric, Dreyfus then goes on to analyze the first two-part invention for quite some time. Frankly, it’s beyond my comprehension, but where he ends up is great. He contends that Bach’s inventions are the laying bare of a process, specifically the deeply difficult process of creating something. They show both the “fulfilled intentions” of the composer as well as his “frustrated desires” (27), because the resolution of dissonance is the very art of them. They are not great because they are elegant; they are great because their very substance must be continually ripped to shreds and put back together. If the invention is the creative spark of a musical idea that also brings with it the material for making that idea into full-scale composition, then what it does not bring is the blueprint for doing this. I believe that what Dreyfus is getting at here is essentially that Bach’s Two- and Three-Part Inventions are interesting not only for all the usual musicological reasons (historically defined), but also in that their analysis yields the indistinguishability of the art and its blueprint. Because the work of art is in the making of that blueprint. If everything else is contained within “creative genius” or the “spark” that inspires the artist, what cannot be found there is a guide to the process of hammering it all out. That is the work of composition. This would mean that the art does not disguise its own work. But that the dissonance and resolution, the sweat of the composer’s brow, is actually embedded in the very composition. And so theoretical analysis does not and cannot reveal a process, for the work makes itself evident. Reaching beyond Bach, but gesturing toward what it is that I find so oddly compelling about playing these pieces, I want to conclude with the observation that we are living through a moment of deeply disturbing lack of appreciation for art work. It is dirty. Even worse, it’s beside the point. Work is passé. In much of what I read – and in fact in much of what I’ve written – there is a presumption that one can coast on a clever idea. We hammer out one hundred and forty characters, without bothering to see the idea through to its logical conclusion. Not only is this mental behavior sanctioned, it is encouraged. This is quite different than what Dreyfus has seen in the invention, which is that an idea – and to be more concrete, we’re talking 8-10 notes here – brings with it an entire world. A piece of music erupts from such a small explosive force. And so our worship of the brevity found in quippyness is perhaps not the problem so much as our tendency to remain stuck therein. In Bach, the idea – the creative genius – is not the point. What truly astounds – if we stand with Dreyfus on this – is the work, the hard labor, the craftsmanship. So I begin to wonder if my craving for these pieces has to do less with the temporal quality of necessarily slow movement, (as I explore in my last post) and more to do with seeking an antidote for a kind of viral way of apprehending the world. *Dreyfus, Laurence. 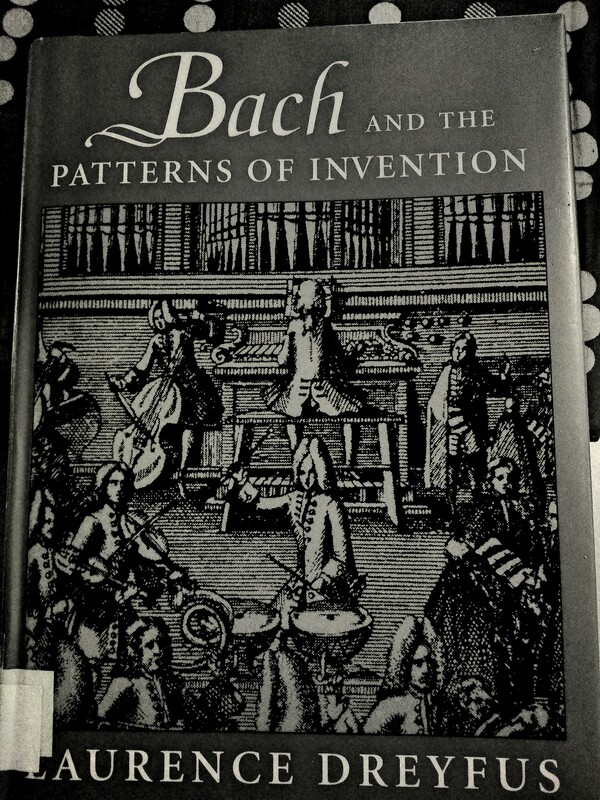 Bach and the Patterns of Invention. Cambridge: Harvard University Press, 1996. **Kidding – why would I know that? But I do now. And I’m sure I’m the better for it. *** And I remember this because a common mistake among the pre-pubescent scholarly set is to declare with some certainty that Benjamin Franklin invented electricity. Which he did not. He discovered it. Because it already existed. See how this works?